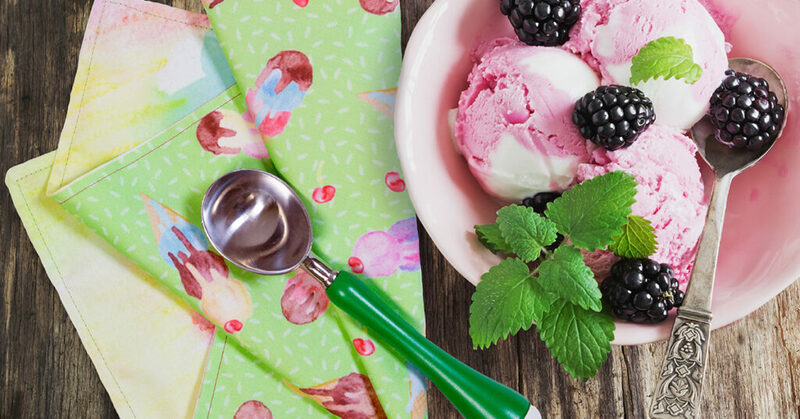 With apologies for announcing the Fabric Of the Week contest results a day later than usual, we're pleased to let you know that the winner of our ice cream-themed Fabric Of the Week contest is Jeni Paltiel, a talented graphic designer who won two previous contests, one using an amazing collage made froms bits of leaves, and the other our competition to create a bunting kit.. This time her design emerged as the winner from nearly 200 ice-cream-loving entries, so today's win is doubly sweet. Nice work, Jeni! We've got another big bunch of entries for the ice-cream-themed contest this week (although not as large as last week's, fortunately), but time-pressed voters should take heart: we're working on a system that will narrow down the entries ahead of time to a more manageable scale. The new system will rely on volunteer contest moderators who are willing to take a few minutes each Wednesday to help us weed out some of the designs before the community-wide voting starts on Thursday. If you are a big fan of our contests and think you might be willing to put in some time as a moderator, sign up to find out more using the form on this page. This week's fabric design contest has around 200 entries, but I know you won't mind because the subject is so very sweet.